Maps are one of my favorite approaches to presenting information. However, they are just as vulnerable to abuse, misuse and overuse as every other form of data visualization. Traditionally, maps employ color ranges, textures, symbols and boundary widths to describe data. It is, however, easy to be distracted by individual regions that are very large rather than the patterns that emerge from multiple areas that may be smaller. In this map of Canada the population density from the 2011 Census is described as a blue colour scale. The largest population is dark blue with lighter shades reflecting smaller populations. Here we see Ontario has the largest population and Nunavut has the smallest (click on the image for a larger version). While your eye is drawn to the darker shades of blue the size of the other provinces and territories compete for attention. An alternative to this approach is the cartogram, which eliminates the distraction of size by modifying the shape of the mapped regions according to regional differences. In this cartogram of the same 2011 population density data, the boundaries of the provinces and territories are inflated and deflated according each region’s population data. Resizing and reshaping the geographies of provinces and territories to describe population size provides a startling view of the country. 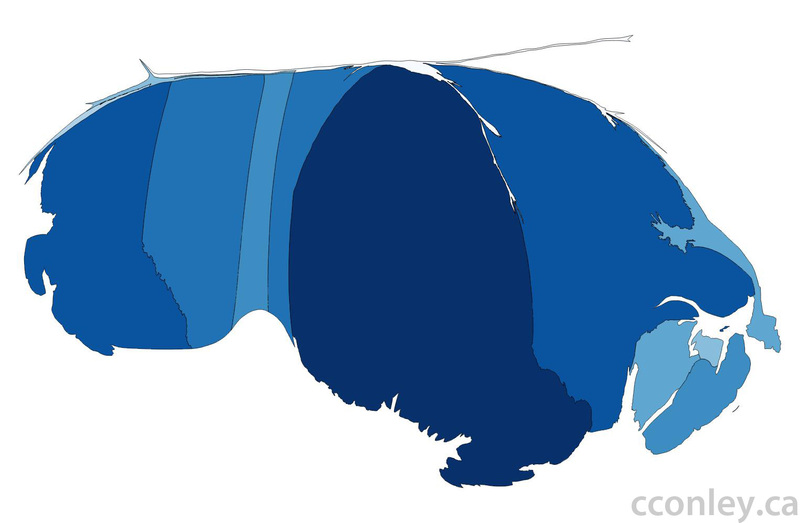 In this cartogram, high population density, like Ontario and Quebec, is reflected in a dark blue boundary that appears to have been inflated like a balloon. Low densities, like the Territories, are light blue with deflated or constricted boundaries that look like ribbons. Cartograms are not restricted to population or frequency data and can be developed using any numeric data that relates to a geographic location. The green cartogram below presents the provincial and territorial boundaries from the perspective of equalization payments. Equilization payments are made by the federal government to the provinces in an attempt to address “fiscal disparities.” Regions that receive equalization payments have often been referred to as “Have-not” provinces. Using information for 2012-2012 shades of green have been used to describe the level of payments each region receives with dark-green representing the largest payments, light green the smallest payments and white representing no payments. Like the last cartogram, the size of the provinces complements the green scale with the largest provinces receiving the largest payments and smaller provinces receiving less. Here we see that Quebec receives the largest payments with the western provinces and territories receiving nothing. When considered from the perspective of Tufte’s data-ink ratio, these cartograms may not be as efficient as a series of bar charts. They do, however, provide a view of Canada that can challenge a viewer’s pre-existing perceptions of the provincial and territorial relationships. When sharing these maps with others the reaction has often been prefaced with “I hadn’t realized…”. Tables or bar charts could be used to present this information but here I am finding cartograms are more provocative and memorable. Population Density data: Statistics Canada. 2012. Canada (Code 01) and Canada (Code 01) (table). Census Profile. 2011 Census. Statistics Canada Catalogue no. 98-316-XWE. Ottawa. Released February 8, 2012. Boundary File: Statistics Canada. Product Number 92-160-XWE. Provincial Boundary File, 2011 Census Ottawa. Released November 29, 2011. http://www5.statcan.gc.ca/bsolc/olc-cel/olc-cel?lang=eng&catno=92-160-X (accessed April 3, 2012). 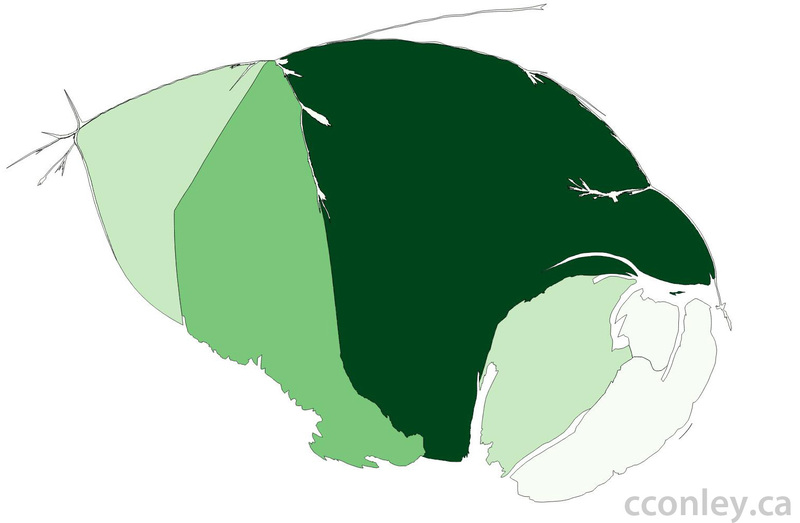 This entry was posted in Data Visualization and tagged 2011 Census, Canada, Cartograms, Data Visualization, Equalization payments, Mapping, Statistics Canada. Bookmark the permalink.